National Bee Hive Dummy Board for Standard Deep Box. Framed 10mm external plywood, fully assembled. This can be used to replace one end frame. The National bee hive is designed to fit 12 Hoffman frames with no gap. This can cause problems if the first frame is covered in bees as they can be rolled and injured against the hive wall and adjacent frame. 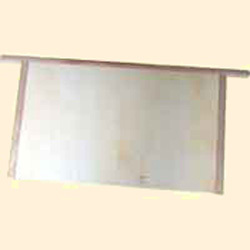 The Dummy Board is thinner than a frame so it is easily removed. This creates a gap so the first occupied frame can also be easily removed. The Dummy Board can also be used to create a false wall in a hive that has a small colony unable to fill it. Known as dummying down it effectively reduces the size of the hive to suit the colony so it does not have too much space to heat and control.